This open concept floor plan offers a large living/dining/kitchen area and floor to ceiling windows for the ultimate view of the Gulf of Mexico. The large patio has extensive Gulf views and a table and chairs for your dining pleasure. The kitchen has stainless steel appliances and all the kitchen wares you will need to make your vacation snacks and meals. Dining area tables seats 6 and the nearby breakfast bar seats 2 more. 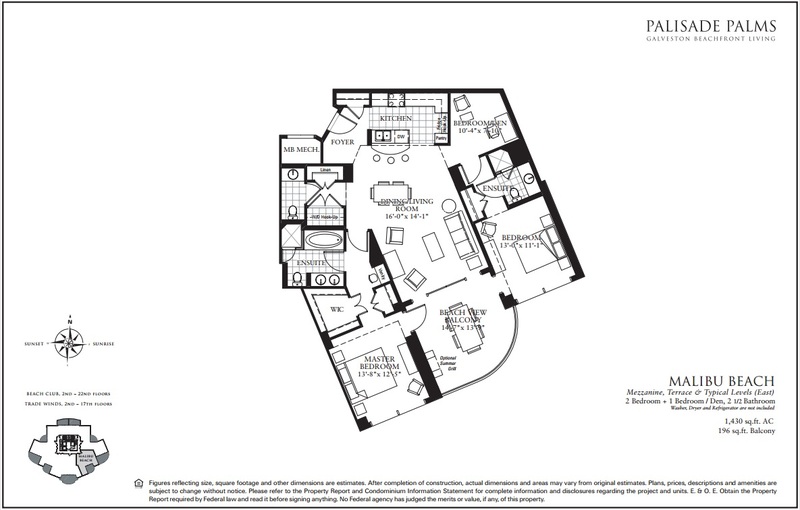 This split bedroom floor plan has the master on one side and two other bedrooms on the opposite side of the condominium. The master bedroom features a King bed, television and a very large en suite bath. Bedroom two has a queen bed with television and Bedroom three has a twin over full pyramid bunk with a twin trundle. Ample closet room is available for all guests. Everyone went above and beyond to make our stay fantastic. Thank you!! We really loved this condo, the kitchen was great to cook in and the layout was great. The best part, though, was the great balcony setup! The huge ocean front balcony was comfortable and relaxing and the back balcony was great for some bay views. I would definitely recommend and look forward to coming back! We had such a wonderful time staying at this lovely Galveston condo. It was more beautiful than the listing description or pictures. The layout has two balconies so you have a view of both the beach and of the bay. Sitting on the balcony lounge furniture was a perfect spot to enjoy morning coffee and in the evening watch the waves roll in with a bottle of wine. The coastal decor was relaxing, fun, and tasteful. The condo was immaculate with all the necessities one would need for a weekend away. It was obvious the owners take pride and joy with all of the simple but nice touches the condo offered. In addition, the location is right on the beach with close proximity to many shops and restaurants. I will definitely be coming back to this condo in the near future and would highly recommend it to any of my family and friends. When we arrived "Wow" came to mind and stayed there until we left... The "Palisade Palms" is a Five Star property that really stands out in the Galveston Beach skyline due to its height and its premium build. The staff at the property were consistently resourceful, friendly and professional. The unit and its view(s), from the 14th floor, were even nicer than they appear in the VBRO pictures. The unit is high enough for amazing views but not too high. There is something special about actually being in this beautiful condo... The owners seem to have thought of everything as it is a wonderfully appointed unit. My friends and I look forward to our next stay at the Palisade Palms!! The condo is beautifully furnished, with anything you can think of that you might need to enjoy your stay. The colors are bright and cheerful! The balconies are situated so that you can always enjoy the view of something different. Whether it be the shrimp boats in the gulf, or the cruise ships coming and going thru the ship channel. There's always a breeze somewhere, and the balcony furniture is extremely inviting. We spent the majority of our time on the balconies. That's what we call a successful vacation! Having stayed in Galveston through the years, this was my first time for a tower style property. The main building has a modern and comfortable feel, with ample convenient parking. The condo itself had a lot of natural light from a bay view patio on one side and ocean views from the other patio doors. The colors of the decorations give a vibrant beach feel. Furnishings of the condo are all new to excellent condition, including comfortable bedding. Appliance and electronics for the condo are very good, including 3 large TVs. 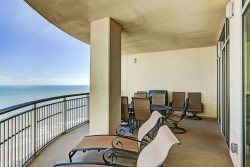 The location on the 14th floor allowed for incredible sunrise views of the Gulf, for an early riser the large patio with large sofa and chairs was an amazing way to begin a day. From the pool, to the game room and close proximity to the beach this was a great location for my wife and I and we look forward to our children on our next trip to this location.